Retired August 1, 1951. Died January 10, 1988. 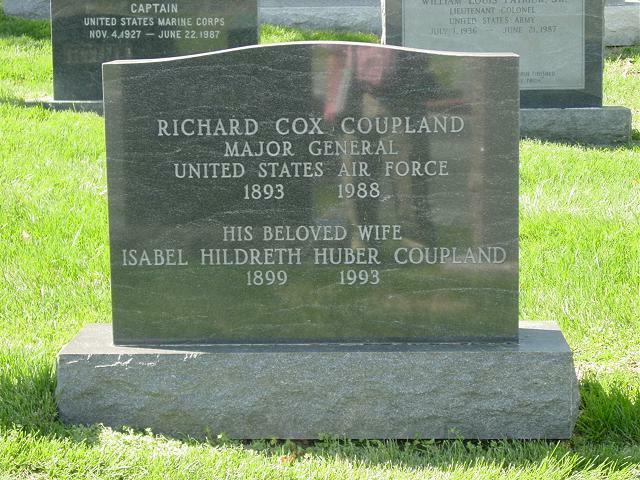 Richard Cox Coupland was born at West Point, Virginia, in 1893. He graduated from Virginia Military Institute at Lexington, Virginia, in 1915, and two years later enlisted as a flying cadet. He graduated from the U.S. School of Military Aeronautics at Cornell University at Ithaca, New York, and commissioned a Second Lieutenant in the Coast Artillery in October, 1917. He then went to Foggia, Italy, where he completed his pilot training in March, 1918, after which he served with the 52nd Artillery of the American Expeditionary Forces in France until the following November. During this time he participated in the Meuse-Argonne Offensive and in the occupation of a defensive sector. Returning to the United States in May 1919, he was assigned to Fort Terry, New York. The following year he received a degree in electrical engineering from Virginia Military Institute, after which he did experimental work at Glouster and Boston, Massachusetts, and Washington, D.C. In October 1921, he transferred from the Coast Artillery Corps to the Ordnance Department and was assigned to Springfield, Massachusetts, for duty in the Experimental Department. In August 1923, he entered the Air Service Engineering School at McCook Field as ordnance representative and post ordnance officer. In July 1928, he went to Washington, D.C., for duty in the Office of the Chief of Ordnance. Four years later he transferred to Raritan Arsenal in N.J., as maintenance and shops officer, and in July 1934, was appointed depot supply post ordnance, and war plans officer at that station. He returned to Washington, D.C., in August 1936, to enter the Army Industrial College, from which he graduated a year later. He then was appointed assistant chief of the Civilian Personnel Division in the Office of the Chief of Ordnance, and subsequently became acting chief of that division. In August 1938, he was designated chief of the Small Arms Division in the Office of the Chief of Ordnance. A year later he was assigned to the Office of the Chief of the Air Corps in Washington as assistant to the chief of the Plans Division. He became a member of the Plans Division in July 1940, and the following November was designated ordnance liaison officer with the Materiel Division of the Office of the Chief of the Air Corps. In January 1942, he became chief of the Accessories and Equipment Section in the Office of the Assistant Chief of Air Staff at Air Force headquarters in Washington. He was appointed air ordnance officer at Air Force headquarters in February 1943, and served in this capacity until March, 1946, when he was designated chairman of the Air Force Materiel and Services Planning Board, whose mission it was to develop and recommend a detailed plan to accomplish the materiel and service objectives of an autonomous Air Force. In June 1946, he resumed his duties as air ordnance officer, and on November 6, 1947, transferred from the Ordnance Department to the Air Force. The following July his title of air ordnance officer was abolished and General Coupland was named director of armament for the Air Force. He assumed command of the Air Materiel Armament Test Center at Eglin Air Force Base, Florida, in April 1950. During World War II, General Coupland's office was instrumental in the research, development and supply of the following ordnance items: high rate of fire and high velocity machine guns; improved 20 mm, 37 mm, and 75 mm cannons; armor-piercing, incendiary, special high-velocity, and headlight tracer ammunition; larger and improved general purpose, fragmentation, blast, semi-armor-piercing, and deep penetration bombs; methods for clustering fragmentation and smaller type, general purpose bombs, so that more economical bomb loads could be carried; bomb fuses which made low-altitude bombing possible; VT fuses, and series of target-identification bombs. General Coupland holds patents covering radio control of dynamic bodies, aircraft gun synchronizers, feed mechanisms of aircraft weapons, computing gunsights, aerial mechanisms and various types of ammunition. General Coupland has been awarded the Distinguished Service Medal, Legion of Merit, Army Commendation Ribbon and the Most Excellent Order of the British Empire in the degree of Honorary Commander. He was promoted to First Lieutenant (temporary) January 31, 1918; to Captain (temporary) November 2, 1918; to First Lieutenant (permanent) July 17, 1919. He reverted to his permanent rank of First Lieutenant May 3, 1920, and was promoted to Captain (permanent) March 16, 1928; to Major (permanent) July 1, 1937; to Lieutenant Colonel (permanent) Oct. 26, 1940; to Colonel (temporary) Feb. 1, 1942; to Brigadier General (temporary) March 18, 1943; to Colonel (permanent) April 2, 1948; to Brigadier General (permanent) June 11, 1948, with date of rank from January 22, 1945, to Major General (temporary) December 21, 1948.